Economists observe that people are generally compensated based on the value they produce. In other words, when people are more productive, they tend to earn more. These trends can be seen in the historical record. Over time, people have gotten more productive, and that has translated into income gains for the average worker. In recent years, however, the gains have been meager for all too many. One of the things holding productivity back and, along with it, compensation, is rent-seeking. When governments dispense privileges to particular firms, entrepreneurs spend their time asking politicians for those privileges instead of devising new ways to create value for customers. 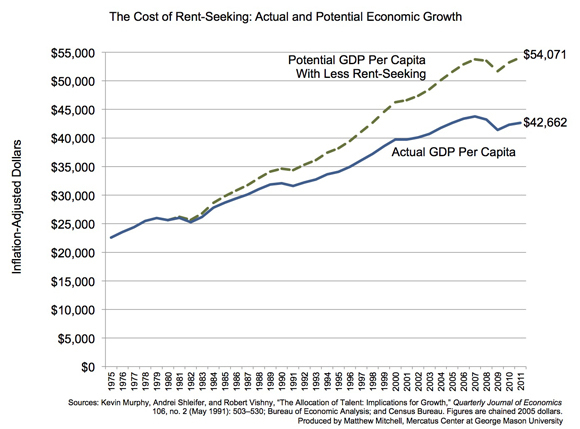 Economists call this activity rent-seeking, and research suggests that it depresses productivity growth. Economists Kevin Murphy, Andrei Shleifer, and Robert Vishny studied this phenomenon using data from dozens of countries. They found that a 10 percentage point increase in the share of students concentrating in law was associated with 0.78 percentage point slower annual growth in per capita GDP. 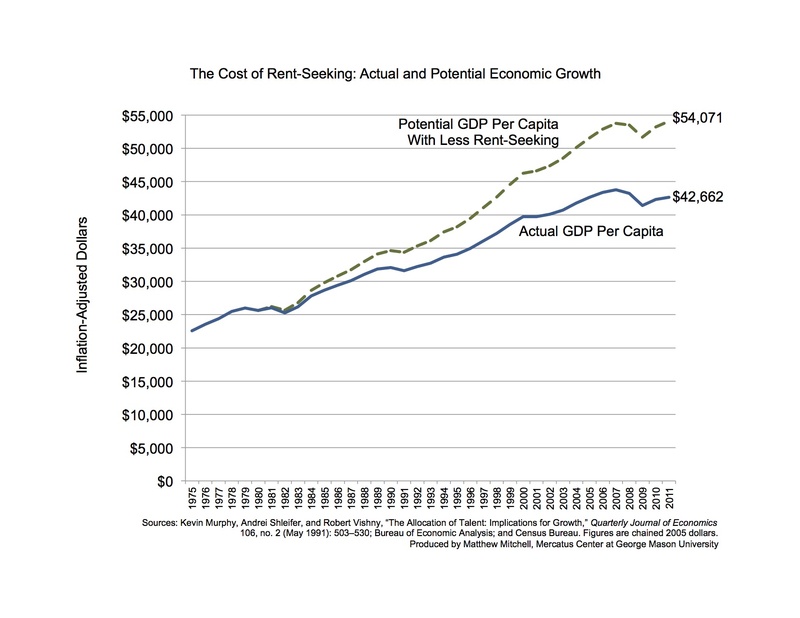 In other words, economic growth was slower in countries where there seemed to be more rent-seeking. Matthew Mitchell is a senior research fellow at the Mercatus Center at George Mason University. He blogs about economics and economic policy at NeighborhoodEffects.com.